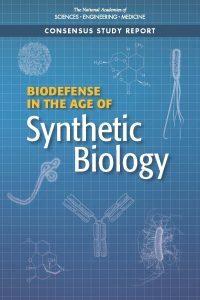 Our new consensus study report is now available via our website: https://www.nap.edu/catalog/24890/biodefense-in-the-age-of-synthetic-biology. For more information, please contact SynBioDefense@nas.edu. To assist the U.S. Department of Defense’s Chemical and Biological Defense Program (CBDP), The National Academies of Sciences, Engineering, and Medicine will appoint an ad hoc committee to address the changing nature of the biodefense threat in the age of synthetic biology. Specifically, the focus of the study will be the manipulation of biological functions, systems, or microorganisms resulting in the production of a disease-causing agents or toxins. The study will be conducted in two primary phases. Initially, the committee will develop a strategic framework to guide an assessment of the potential security vulnerabilities related to advances in biology and biotechnology, with a particular emphasis on synthetic biology. The framework will focus on how to address the following three questions: What are the possible security concerns with regard to synthetic biology that are on the horizon? What are the time frames of development of these concerns? What are our options for mitigating these potential concerns? The committee will publish a brief interim, public report outlining the developed framework. This framework will not be a threat assessment, but rather, will focus on ways to identify scientific developments to enable opportunities that have the potential to mitigate threats posed by synthetic biology in the near-, mid-, and long-term, with the specific time frames defined by the committee. The framework will lay out how best to consider the trajectory of scientific advances, identify potential areas of vulnerability and predict promising mitigation opportunities. In Phase 2 of the study, the committee will use the outlined strategic framework to generate an assessment of vulnerabilities posed by synthetic biology. Inputs to this assessment may include information about the current threat, current program priorities and research, and an evaluation of the current landscape of science and technology. Conclusions and recommendations will include a list and description of vulnerabilities posed by synthetic biology and prioritized options to address them. Please click here for more information about past meetings. Please click here for full biographies of all committee members. Please email SynBioDefense@nas.edu with any questions regarding this study.